If you want to get an idea of how many e-mails Jay Luchs gets in a day, ask him to empty his pockets. There’s an iPhone, which for all intents and purposes serves as Luch’s office phone, the majority of his days spent behind the wheel of his BMW, zipping between the seemingly endless supply of luxury retail spaces he represents across the city, from Abbot Kinney to Rodeo Dr. to Cross Creek. Standard stuff, OK, and then— is that a Blackberry? “For e-mails,” Luchs says nonchalantly, pulling a Blackberry Classic out his pocket. “I can’t type on [iPhones].” And if owning a Blackberry solely for the purpose of writing and sending e-mails doesn’t paint a vivid enough portrait of the schedule Luchs faces on any given day, the third thing he keeps on his person at all times should do it. Yes, that’s right: it’s a second Blackberry Classic utilized solely for the purpose of writing and sending even more e-mails. So how many e-mails does Jay Luchs get in a day? “A lot,” he says. If you’ve spent any amount of time in L.A.’s tonier areas, chances are you’ve seen Luch’s name. Chances are you’ve seen it 10,000 times. Pick a street at random in Beverly Hills or Venice or Malibu, or a street at random where you can buy a T-shirt for $1,000, at least, and you’re sure to see his trademark red-and-white signs plastered on any prominent stretch of vacant storefront. Gibson Guitars’ recent lease of the old Capitol Records building? Luchs brokered that, as he did the the massive new Eataly that just opened up in the Century City mall, the L.A. outposts for brands from Lanvin to Jimmy Choo, and a N. Rodeo building that set records for the highest commercial sale in L.A.’s history when he sold it to LVMH in 2012. If Luchs, one of the most prominent and successful commercial real estate brokers in the city, seems today distinctly suited to the job he has today, his road to it has been somewhat circuitous. Instead he decamped to a Brentwood apartment, sent his resume around to networks and agencies, and was soon at the helm of a promising career in current programming at the television network UPN. Fast forward 6 years, however, and Luchs was ready for a career change. Having grown weary of current programming, Luchs decided he would try his hand at something new, and after interviewing at a range of companies, accepted a spot in the mailroom at Endeavor (now WME), a competitive but grueling gig Luchs hoped might position him for a professional shift into television development. However two weeks in, exhausted and surrounded by 22 year-olds, Luchs knew he’d made a mistake. “I had had enough,” he says. “I thought, maybe it’s time to get into a business that from what I’ve heard, gets better with age.” That day he called up Insignia/Edward S. Gordon, a real estate services firm based in Beverly Hills where he’d interviewed just a few weeks prior. Any chance they’d still hire him? he inquired trepidatiously. “And they did,” he said. Luchs went to work in the investment sales department as an assistant to two realtors, helping facilitate deals and steadily learning the ropes. If Luchs didn’t catch the real estate bug immediately, he did two years later, when one day he drove past 468 N. Rodeo Dr. Immediately the sprawling, two-story storefront caught Luch’s eye. Perched at the corner of Rodeo Dr. and Santa Monica Blvd. the building felt unique in its location and was hard to miss: had stately columns, elegant stone detailing and massive arched windows. Even better yet: it was vacant. In the years since his Brooks Brothers sale, Luchs has worked with a veritable who’s who of luxury brands, from Louis Vuitton to Gucci to to Missoni and Christian Dior. In 2013, Luchs left CBRE, which had ultimately acquired Insignia/Edward S. Gordon, for Newmark Knight Frank, at which he currently serves as vice chairman. Now heading an office of six, Luchs has become one of the most successful commercial real estate agents in the city, and recently partnered with Steven Schaefer to head Newmark’s new residential real estate wing. Their first sale closed at the end of last year, a Malibu home that sold for $26 million to none other than Simon Cowell. 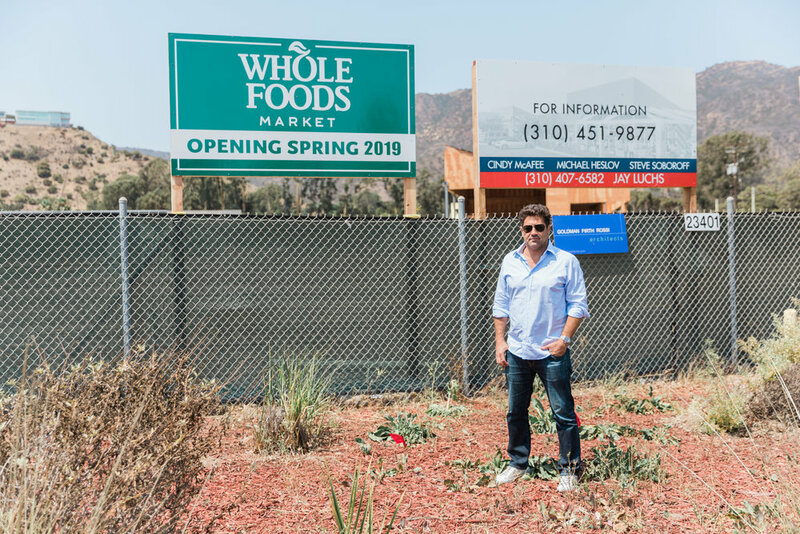 Luchs in front of construction of the new Whole Foods/Park site, which he is leasing. Which isn’t to say that Luchs’ career has been all smooth sailing. Bricks-and-mortar retail has taken as shoppers increasingly turn online, a setbalk Luchs contends his industry is still learning to navigate. “It’s challenging,” he said. “Retail is changing forever, like the publishing industry, or the music industry. It doesn’t mean it’s dead. And It doesn’t mean it’s not going to be as cool as ever. But we’re going through a transformation.” Does he worry about what that transportation could spell for his indstury? “It’s not setting he back,” he says. “There are still tenants doing deals, one way or another.” Indeed Luchs says he believes there is a significant role for brick-and-mortar space to play as online retail becomes more dominant. Luchs mentioned brands like Warby Parker, the popular glasses retailer which began online but has gone on to open retail stores, as well as the RealReal, a luxury online consignment shop which recently opened up their first L.A. outpost on Melrose Ave., a deal that Luchs was behind. Despite his crazy schedule, the daily drives from the west side to the east side, and the two Blackberrys just for e-mailing, Luchs says he can’t imagine doing anything else.